For nearly four decades, the Accord has set the benchmark for vehicles in the midsize sedan class, historically the most popular class of vehicle with American car buyers. Accord is widely recognized as a segment-defining product, delivering class-leading interior space and superior ergonomics along with outstanding fuel efficiency, refined and responsive driving dynamics and top-class safety performance. As one important bellwether of its success, the Accord has been named to Car and Driver magazine’s “10Best” list a record 29 times, a feat unmatched by any other automobile of any type. Accord was the first Honda model and first vehicle from a Japanese automaker to be manufactured in America and has been in continuous production at the company’s Marysville, Ohio auto plant using domestic and globally sourced parts since November 1982. It has also been produced in the company’s plants in East Liberty, Ohio; in Birmingham, Alabama; and in El Salto, Jalisco, Mexico. Honda has produced more than 10 million Accords in North America for both local and global markets. The 2016 Accord’s sportier design is matched by its improved dynamic performance. Accord body rigidity is increased for all models and is complimented by new high performance dampers, and a retuned electric power steering system that delivers even more linear and precise response. The Accord Sedan also gets a new aluminum hood, replacing the previous steel hood, benefitting both fuel efficiency and dynamic performance. The Accord also gets new Straight Driving Assist technology that helps reduce the driver’s workload when driving on a crowned or canted road surface (see Chassis section for more details). All 2016 Accord models also feature a standard Multi-Angle Rearview Camera and Expanded View Driver’s Mirror. The Touring trim adds new auto high-beam headlights that enhance nighttime visibility and driving convenience (see Safety and Driver Assistive section for more detail). 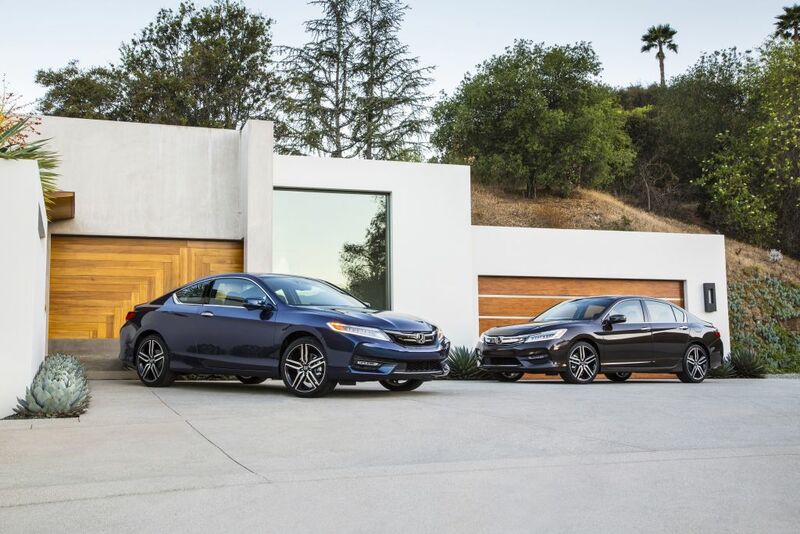 The Accord incorporates Honda’s next-generation Advanced Compatibility Engineering™ (ACE™) body structure, designed to more efficiently absorb and disperse the energy from a frontal collision, along with new ultra-high-strength door rings designed to help better protect occupants. Standard safety and driver-assistive features include four-channel anti-lock brakes (ABS) with Brake Assist and Hill Start Assist; Vehicle Stability Assist™ (VSA®) with Traction Control; an Expanded View Driver’s Mirror; dual-stage, multiple-threshold front airbags, driver and front passenger SmartVent® side airbags and side-curtain airbags for all outboard seating positions; and Tire Pressure Monitoring System (TPMS). See the Safety and Driver Assistance section for more information.